Important: Bomb Actions are the only way you can score victory points! It will ultimately be a Bomb Action that ends the game and determines the winner. Plutonium Bombs (blue cards) have two different point values: The left number is the amount of points the bomb is worth if you have not yet completed an Implosion Test; If you have tested a bomb, you receive the higher number of points for all Plutonium Bombs you build (including any built before your test). Building bombs is your primary way to gain victory points. In order to build a bomb, you must have a Bomb card in your hand, the required Workers in your supply, and enough Bomb Fuel of the correct type on the Main Board. These requirements are shown at the top of the Bomb card. Play the Bomb card face up next to your Player Board. 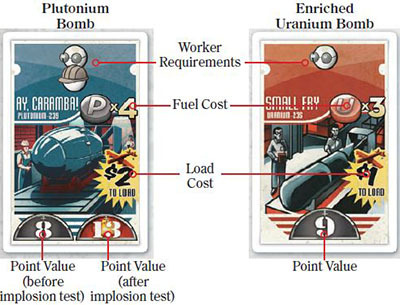 Place the required Workers on the Bomb card, and move your marker down on the matching Bomb Fuel track on the Main Board (uranium or plutonium). 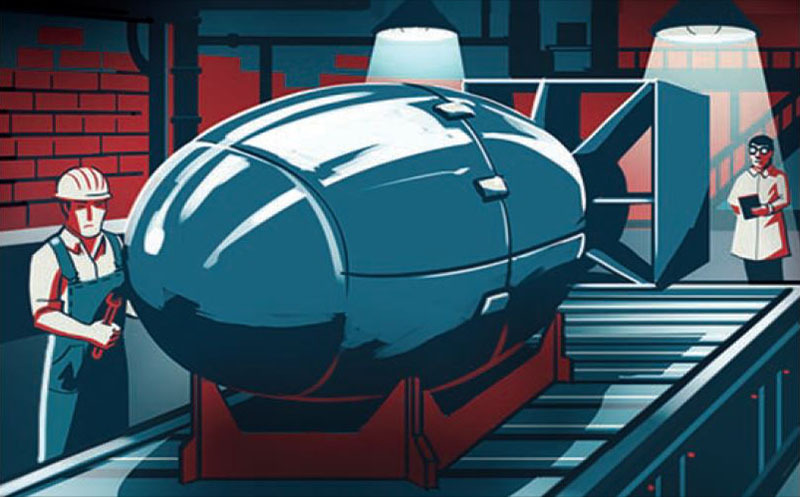 Once you have paid the required costs, your bomb is complete and you score the points shown on the Bomb card. Plutonium Bombs are much more complex than Enriched Uranium Bombs. Until you actually set one off, you don't really know what they can do! In order to get the full value of the Plutonium Bombs you build, you are going to have to make an Implosion Test. You can use any Plutonium Bomb you have built for your test. You may even test a bomb on the same turn you build it. However, you may only test one bomb during the game. To test a bomb, simply place the Bomb card face down at the bottom of the bomb deck (it has been detonated, so you no longer have it). Then take the highest value Implosion Test counter from the General Supply and place it next to your Player Board. You receive Victory Points equal to the value on the Implosion Test counter (but you lose the points from the bomb you detonated). For the rest of the game, you earn the higher victory point value on all Plutonium Bombs you own. If the Bomb card you use for the test has any Workers on it, place them on your Implosion Test counter. If there was a Loaded Bomb marker on it, return it to the General Supply (you also lose the 5 points for loading the bomb). Having atomic bombs is one thing, but being ready to use them is something quite different. To fully prepare a bomb for use, it must be loaded onto a bomber so it is ready to be used by your nation's armed forces. This awards you 5 Victory Points. To load a bomb, you must pay the Loading Cost shown on the Bomb card and lower your Bomber counter one space on the Bomber Track of your Player Board - that bomber is no longer available for launching Air Strikes. Take a Loaded Bomb marker from the General Supply and place it on your Bomb card. Each bomb may be loaded only once. Loaded Bomb markers are not limited: if you run out, use any suitable substitute.